BEST of 2013- 2017 five stars rating for Florida, performing in the most upscale venues and hotels. Under the international violinist, who performed in opera houses around Europe with many luminaries like P.Domingo, A.Bocelli, and Royal Caribbean International. We can provide any style of music, for any type of event. We can offer you solo, duo, trio, quartet, with a variety of instrumentation, with professionally trained and talented musicians. We are customizing the music repertoire based on your requests. Our prices are reasonable for high quality LIVE performances. We can set up an appointment, and perform for you without obligation. Looking forward to making your event beautiful !!! Unbelievable!!!! Absolutely made our bar mitzvah brunch. Ewa showed up on early and played the most wonderful music that was entirely appropriate for our crowd of kids through seniors! What a repertoire!!!! We were so happy with her. Definite thumbs up!!!! It was an amazing night at Mar a Lago celebrating at a surprise party for my wife's birthday. During the cocktail hour the added elegance was having Eva Smith play her magical violin as she strolled through the room amongst the guests. She concentrated on Broadway Hits and classic songs of the 40's and 50's fitting the party's theme. Her repertoire was impressive as was the mastery of her instrument. During dinner when the Orchestra took their break Eva again delighted the guests with her enchanting music. She also looked amazing and added sophistication to a night we will long remember. Highest recommendations for this real professional. Thank you for your making me a part of your lovely wife's birthday. It was a pleasure to perform for you and your wonderful guests at the beautiful Mar-a-Largo. It was a very classy event that I was proud to be a part of. Wishing you all the best ! Ewa is a very talented performer and she added a beautiful musical aspect to our wedding day! She has a large repertoire of classical and popular music selections and was very accommodating of all our special requests (and helpful in suggesting appropriate pieces to fill in the gaps!) Most importantly, she is enthusiastic and always aims to please. 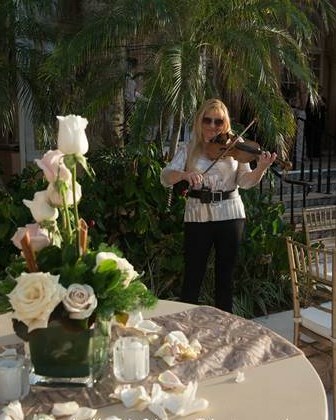 You will not find better value for a violinist in Miami! We are so happy with our decision to use The Magic Strings for our wedding ceremony and cocktail reception. They are professional, talented musicians with a wide repertoire. They were very accommodating and flexible and customized the music to be played throughout and truly made our event so special. Our guests greatly enjoyed their performance and we will definitely be brining them back to play at our next event. Ewa is an amazing performer and also very professional. 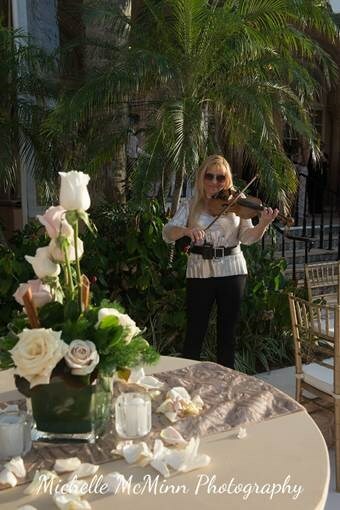 Her violin playing with accompaniment enhanced our classical and elegant wedding. My guest were impressed with the quality of her performance. She is very accommodating, when I asked her shortly before the start of the ceremony to move her set up to another area, she complied immediately with no fuss. I would hire her for another event without a doubt! I loved Ewa! My wedding was yesterday and I can't express enough how talented she is . She exceeded my expectations and all the songs I asked her to play were beautiful. I definitely recommend her ! If I could, I would rate Ewa and his AMAZING pianist with a constellation of stars!!! 5 stars is not enough for this MAGIK PEOPLE! Magik Strings are very professional and friendly. They are very detailed oriented and the most important--they got talent. A LOT OF TALENT! My wedding was a fairy tale wedding and everyone cried in the ceremony (the wedding planner also cried!) when they played A Thousand years on my grand entrance. I am not exaggerating. All my guests are still talking about how magical they played. If you want to impress your guests, Magik Strings will do it for you! Thank you, Ewa! God bless your talent! Keep playing! I'm a very happy bride! I must say Ewa is the most talented Violinist we have heard. I searched for months looking for a violinist for our wedding and once I heard Ewa I just knew she was the one! Thank you so much for making our wedding amazing. The guests really enjoyed the music and the moment was more magical having you there. You're the best! 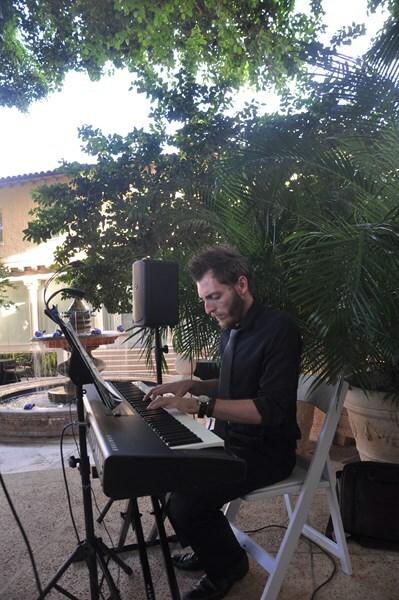 We hired Milosz (the pianist) to play at our wedding on about 3 weeks notice, and his performance was amazing. Milosz was very easy to work with, and made everything we threw at him sound beautiful. We wanted a mix of country music and contemporary Christian music at our wedding, which we doubt he plays a lot of, but we were blown away by how great everything sounded. One piece in particular ("Would You Go With Me" by Josh Turner) is very upbeat and fast tempo, but he slowed it down at our request for the groom to walk out to, and it was better than anything we could have imagined. We couldn't be happier with Milosz' performance, and we highly recommend him! How Long Will I love you"
Please note MUSIK FOR YOU CLASSICAL AND ELECTRIC VIOLINIST will also travel to Miami, Key Biscayne, Coral Gables, Hialeah, Miami Springs, Opa Locka, Hallandale, Hollywood, Miramar, Miami Gardens, Pembroke Pines, Dania, Fort Lauderdale, Princeton, Homestead, Leisure City, North Lauderdale, Pompano Beach, Florida City, Coral Springs, Coconut Creek, Lighthouse Point, Parkland, Deerfield Beach, Boca Raton, Delray Beach, Key Largo.